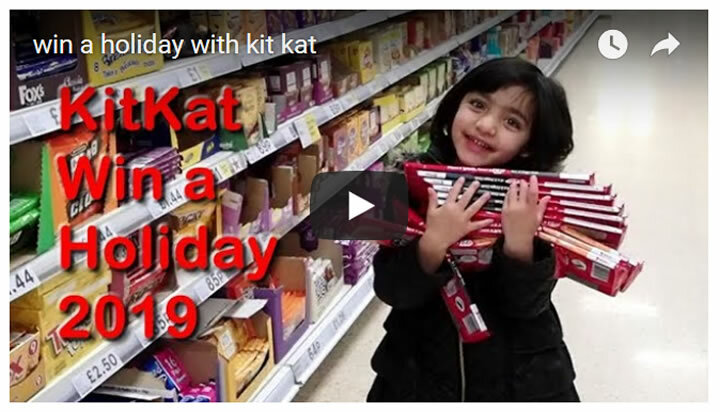 KitKat's new promotion went live online on the 1st of Feb, where the top prizes are 10 holidays worth £8,000 each which can be instantly won by finding a golden ticket inside a Kitkat packet. Additionally 100 getaway goodies are available to be won EVERY DAY just by entering the codes found on the inside of kitkat wrappers. Watch our video for the full details of what should prove to be an easy to win promotion. Especially given that multi-packs of Kitkat's can currently be had for just 90pence, as opposed to £2 to £2.20, means that NOW is the time to stock up! Ensure to subscribe to our channel for new easy to win promotions. Disclaimer: The above is a matter of opinion provided for general information purposes.